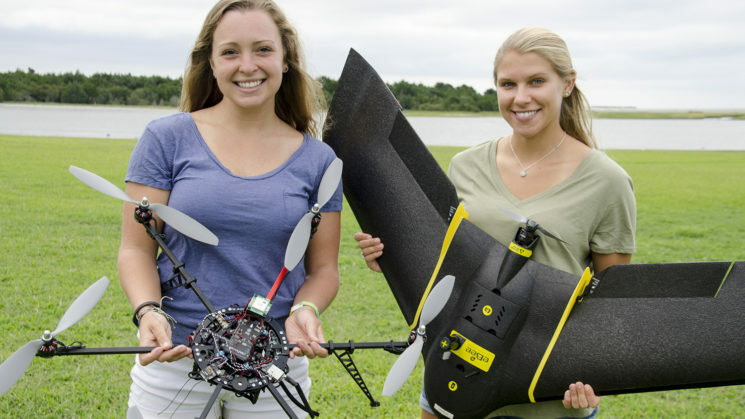 Above: Sarah Poulin, left, and Anna Windle used drones to survey oyster reefs in the Rachel Carson Estuarine Research Reserve in Beaufort, N.C. Oyster reefs play an essential role in coastal and estuarine environments. They provide a suite of ecosystem services, such as providing habitat for juvenile fish, serving as buffers to storm and wave energy, filtering pollutants from the water, and much more. They’re also pretty tasty. Oysters have been harvested for consumption for centuries. However, today water people in North Carolina only bring in 15 to 20 percent of what was once harvested annually. How come? Since the early 1900s, North Carolina’s oyster population has declined by an estimated 50-90 percent due to overharvesting, disease, poor water quality and habitat loss, according to N.C. Coastal Federation. Vast stretches of coast-hugging, or fringing, oyster reefs have disappeared, leaving fishermen, conservationists and others concerned about the sustainability of their populations. In response to the decline, in 2001 the N.C. Division of Marine Fisheries (DMF) implemented management plans and restrictions designed to limit overharvesting. The agency based these new plans and restrictions on the results of a decades-long mapping project. In 1988, DMF began using GPS and geographical information systems, or GIS, to delineate and map habitat types in every estuarine ecosystem in the state. One of the goals was to determine area and abundance of shellfish, including oysters. Thirty years later, the agency has mapped 90 percent of bottom-dwelling shellfish in those estuarine ecosystems. Now that baseline mapping efforts of these estuarine ecosystems has been achieved, a quicker and more efficient method is critical to continue monitoring of important shellfish species, such as oysters. A lot can change in three decades, including oyster health, abundance, and the area they cover. In recent years, managers have used aerial imagery from satellites and occupied aircraft to monitor oyster reefs over time. One advantage of these remote-sensing techniques is that they don’t disturb the landscape. However, low-resolution images from sensors on occupied aircraft and satellites can leave out smaller-scale patches of oysters and can inaccurately classify similar-looking habitat types. These methods also can be costly and time-sensitive, and they’re reliant on clear weather. Unoccupied aircraft systems (UAS), or drones, are transforming the way we collect scientific data. They bridge the gap between sampling in the field and established remote-sensing approaches. Drones can collect significantly higher-resolution imagery, enabling us to see fine details, such as small oyster reef patches. With increasing battery life and advancements on platforms and sensors, we can now collect thousands of centimeter-scale resolution images of an environment during a 45-minute drone flight across close to 3,000 acres. While established methods can measure to the nearest meter of an oyster reef, drone imagery has the ability to measure individual oysters to the nearest millimeter. For our project, funded by a N.C. Sea Grant/Space Grant joint fellowship, we used drones to collect data on oyster reefs located in the Rachel Carson Estuarine Research Reserve in Beaufort, North Carolina. We explored different types of drone platforms, sensors and processing options to determine which were the most effective for oyster reef monitoring. We studied intertidal fringing reefs located on the east end of Town Marsh, an island portion of the reserve, as well as manmade intertidal reefs in Middle Marsh, an area of interconnected marshland located on the west side of the reserve. All of the aircraft provided hundreds of high-resolution images. When we got back to the lab, we used a processing software that stitches the images together to form a highly accurate photo representation of an area, known as an orthomosaic. The orthomosaic was geometrically corrected and aligned to a known coordinate system. Using elevation measurements, the software can also create digital surface models — maps that represent the earth’s surface, including all objects on it. These maps allowed us to analyze the entire area we surveyed. Reef area and height are widely used metrics for oyster reef monitoring. 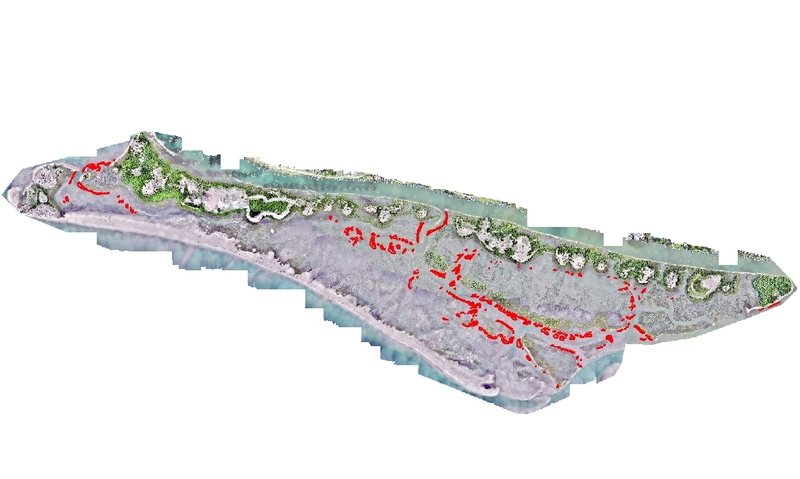 Using the high-resolution orthomosaic, we delineated the edges of oyster reef patches in order to calculate total oyster reef area. 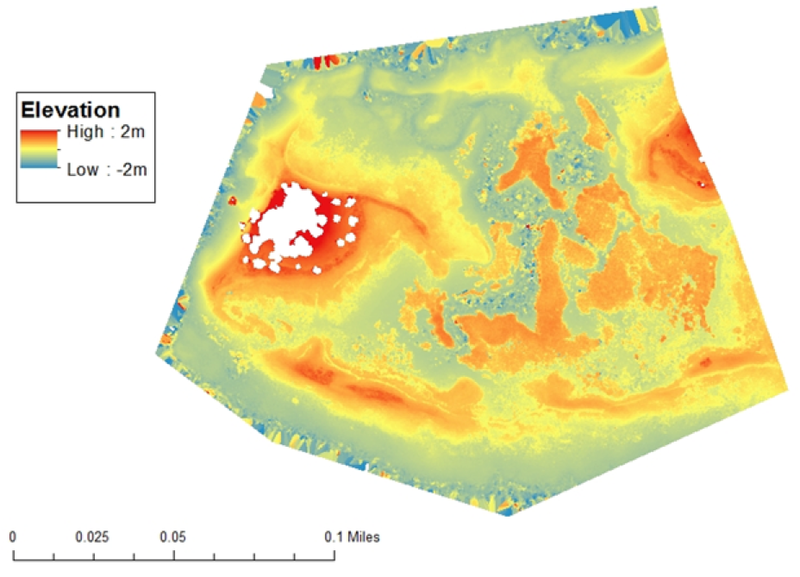 Using the digital surface model, we calculated oyster reef height. We calculated these metrics for a one-square-mile area in just a matter of minutes. 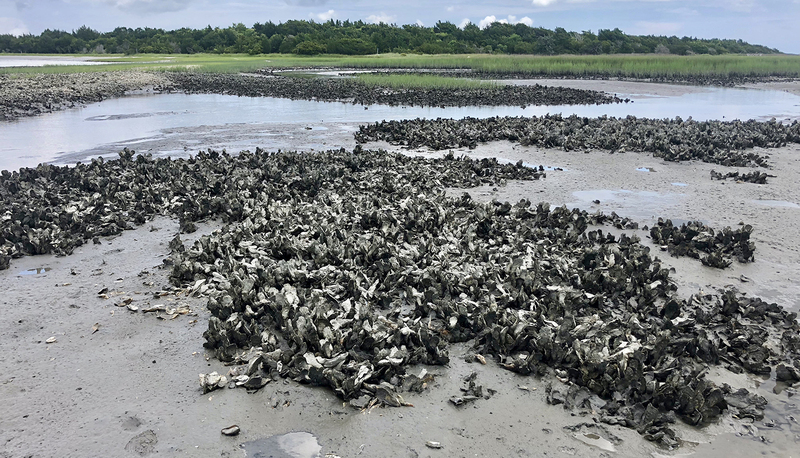 Brandon Puckett, research coordinator for the N.C. Coastal Reserve, had informed us that managers at the Rachel Carson Reserve did not have an accurate estimate of oyster reef habitat in its total 2,315 acres. In a couple days, we were able to identify 11.83 total acres of intertidal oyster reef from analyzing drone imagery of the entire reserve. Methods involving UAS are quicker, more accurate and less environmentally disturbing than traditional, time-consuming field methods. We hope that the results from our research — which we plan to submit for publication — will help managers and researchers alike to choose the best type of aircraft and sensor for their intended purpose. For more on this project, check out this interactive story map. 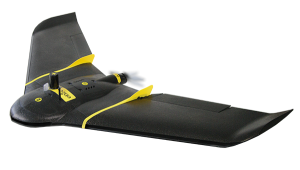 The researchers used a fixed wing drone called the eBee Plus, equipped with a Sensor Optimized for Drone Applications sensor. 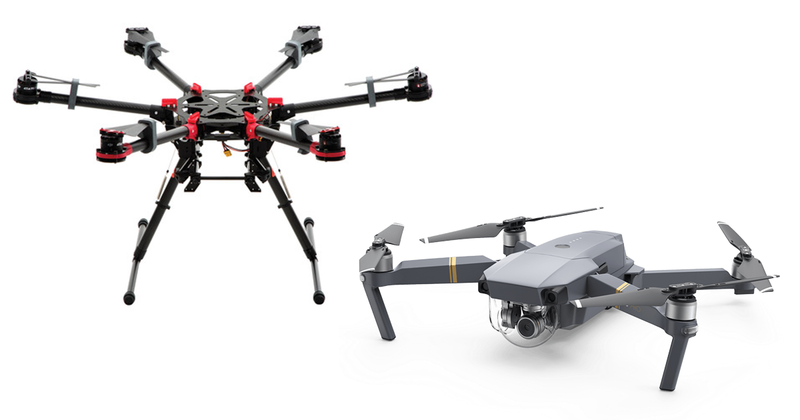 The researchers used two rotary wing drones: the DJI S900 hexacopter, left, equipped with a Sony 6000a digital camera, and the DJI Mavic Pro, equipped with a 12-inch megapixel camera. For more on the drones used in this project, visit North Carolina Space Grant. After earning master’s degrees in environmental management, Anna and Sarah are continuing to pursue more research opportunities. Anna is now a doctoral student at the University of Maryland Center for Environmental Science at Horn Point Laboratory in Cambridge, where she uses satellite and UAS remote-sensing methods to assess water quality of the Chesapeake Bay. Sarah Poulin is currently a research associate for the Marine Geospatial Ecology Lab at the Duke Marine Lab, with plans to apply to a doctoral program next fall. This article was updated on Nov. 13, 2018, to reflect the following correction: The students used a DJI S900 drone, not a Matrice 600, as originally stated.